The elements in nature consist of molecules formed from atoms. The atoms are characterised by a positively charged nucleus and by peripheral negative electrons, which determine their species. The nucleus in turn is formed of neutrons and protons – collectively known as nucleons – held together by extremely intense forces within a short range of action. The mass of the nucleus is less than the sum of the masses of the nucleons (protons and neutrons) that form it. The mass difference (Δm), which is related to the binding energy according to the mass-energy equivalence principle ΔE=Δmc2 , is called the mass defect. What about nuclear fuels? The nuclei that have the lowest binding energy per nucleon provide nuclear energy by fusion if they have low atomic mass and by fission if their atomic mass is high. 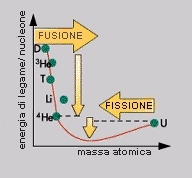 The fusion reaction: two light nuclei fuse together and form a heavier nucleus. Here the energy is released because the mass of the resulting nucleus is lower than the mass of the two reacting nuclei. The fission reaction: a very heavy nucleus splits into two lighter nuclei. In this case, too, the total mass of the components is less than the mass of the original nucleus. For the same amount of reactants, the energy released during a nuclear reaction is millions of times the energy released during chemical reactions (combustion).